Not quite. In fact, some well-read experts have suggested that special precautions be taken in view of the iffy forecast for today. But yesterday was quite Spring-like. The Boy Wonder had a photography assignment to do, so we went out looking for proteas. Is this one? 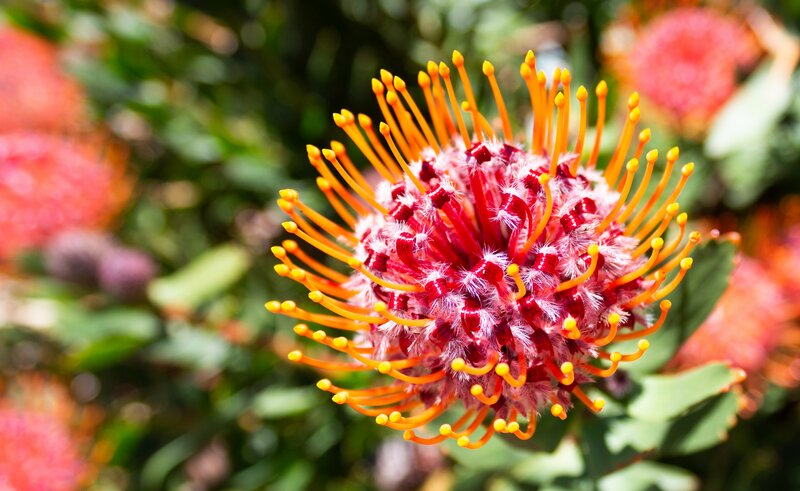 It’s definitely a Leucospermum spp. I think, anyway. Rupert will doubtless let me know. Cycling (yeah, I know) around the posher areas of Cape Town, we found several or more. Lots still to come at “that bush” on the corner of Glastonbury and Rhodes Drive, as well. This one was just up the road from there. Planted outside a big house with a big wall. Probably out of place. Maybe not even a protea at all. But the colours and the intricate design caught our eyes and our lenses. I’ll get some photos up on Flickr soon enough, but in the meantime, here’s one to brighten up a grey day.